I’m going to be experimenting again with a news feature that I ran a few years back. 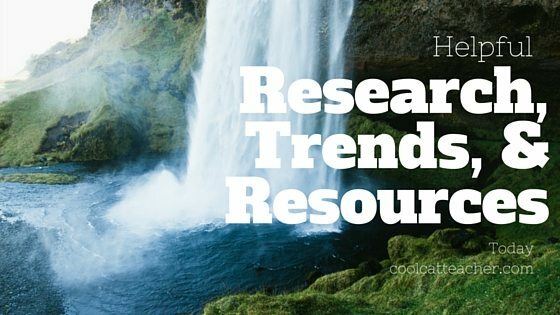 I’ll summarize some of interesting research, trends, and helpful resources. Let me know in the comments if you like me bringing back this feature and if you find it useful. I plan to try this for a while and measure the response. I want to help educators be excellent every day. Part of being excellent is reading things and being a lifelong learner. Tweet me things you think need to be shared on a wider basis. Cool virtual reality tool. I have one my sister gave me for Savannah college of Art and design that they did with the iPhone. It was incredible. Cardboard with a smartphone inserted. It uses the accelerometer inside to really make it feel 3d. It does. You can actually get kind of dizzy. NASA mars scientists posted at 1:30 pm on 9/28/2015 just a few hours after it was announced that liquid water was found on MARS — that they would be answering questions on Reddit. This is a cool thread. yet another reason to join Reddit. 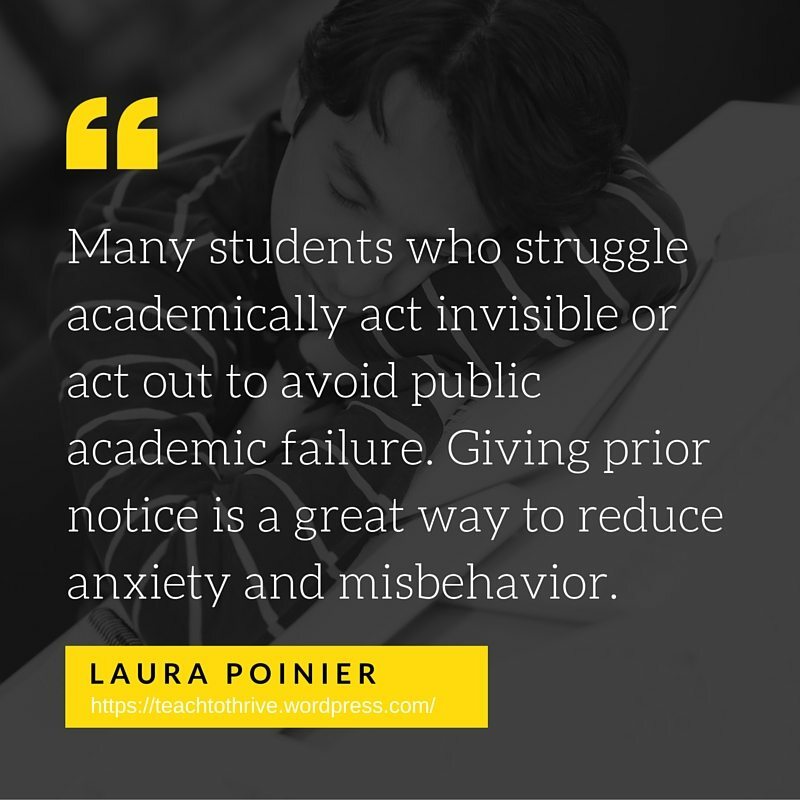 Laura Poinier’s post has some easy-to-do strategies that can help you start differentiating NOW. I especially love what she says about giving kids prior notice. The simplest and most effective strategy to help students succeed is to give them extra time to process. Do this by giving prior notice before cold-calling. Assure specific students that you will never “cold-call” them and will instead let them know ahead of time when they will be asked to participate. How? During independent practice or bell ringers, privately tell a student, “Your answer to number one is perfect; I’m going to ask you to share it when the timer goes off,” or “After Bobbi and Jake read, you are going to read paragraph three aloud.” Many students who struggle academically act invisible or act out to avoid public academic failure. Giving prior notice is a great way to reduce anxiety and misbehavior. A fantastic overview / reminder to students about some incredible research tools right in front of them. Share this one! This is an awesome article with tons of quotes from writers. A marvelous one to share with your creative writing classes. “The authors–C. Kirabo Jackson, associate professor of human development and social policy at Northwestern University, Rucker C. Johnson, associate professor of public policy at University of California, Berkeley, and Claudia Persico, a doctoral candidate in human development and social policy at Northwestern University–show that “increased school spending is linked to improved outcomes for students, and for low-income students in particular…Increasing per-pupil spending yields large improvements in educational attainment, wages, and family income, and reductions in the annual incidence of adult poverty for children from low-income families. Scientists are continuing to advocate that work and school start later. Researcher Paul Kelley CLAIMS that test scores and work productivity should start at 10am. Of course, what he doesn’t account for that this would push sports to later in the day and kids would go to bed even later than they do already. You can only cram so much into a day. Anyway, it is interesting reading. One of the most important things is emphasizing and encouraging to parents that kids get enough sleep. “Children of anxious parents are more at risk of developing an anxiety disorder. But there’s welcome news for those anxious parents: that trajectory toward anxiety isn’t set in stone. The research on why music is so helpful in the classroom. Much of Mangen’s research focusses on how the format of reading material may affect not just eye movement or reading strategy but broader processing abilities. One of her main hypotheses is that the physical presence of a book—its heft, its feel, the weight and order of its pages—may have more than a purely emotional or nostalgic significance. People prefer physical books, not out of old-fashioned attachment but because the nature of the object itself has deeper repercussions for reading and comprehension. “Anecdotally, I’ve heard some say it’s like they haven’t read anything properly if they’ve read it on a Kindle. The reading has left more of an ephemeral experience,” she told me. Her hunch is that the physicality of a printed page may matter for those reading experiences when you need a firmer grounding in the material. The text you read on a Kindle or computer simply doesn’t have the same tangibility. One interesting note on this article. They don’t follow some of the principles of helping make a page readable online. I found the page hard to read not because of the words, but the layout. I would argue that the way a page is presented also impacts how reading happens. This article talks about how today’s teaching is going to change the business world. Sadly, I think that much of the teaching they CLAIM happens (such as mobile learning and differentiation) may not be as widespread as they think. Either way, this generation is different and I do think they expect to be a truly mobile workforce. Of course it will be interesting to see how the kids who are lucky enough to have personalized learning feel about the workforce. And I’m seeing this too. This generation wants to start their own business. We see this with Shark tank type experiences. This is a cool overview of what one college is doing as they literally help students start businesses in school instead of doing projects that go in the trash. The post Improving the Education of Kids in Poverty and Other Helpful News appeared first on Cool Cat Teacher Blog by Vicki Davis @coolcatteacher helping educators be excellent every day. Meow!